A 90ft true performance world cruising yacht combining brilliant sailing with genuine luxury. 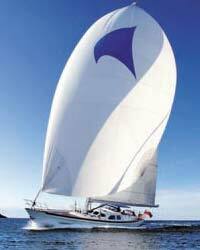 BooToo was launched in April 2002 and is now available for your sailing adventure. Click here to find out where Boo Too is right now! Interested in a luxury holiday - then contact your local yacht broker with your questions and they will be answered fully and comprehensively. Your broker will also send you a BooToo brochure and make all the necessary arrangements for your holiday.